If you work within a care home environment, then you are required to hold certain valid and up to date training certification. www.onlinecarehometraining.co.uk offer an online training solution, which will meet your requirements. Their courses are conducted using a video based training system, with instructor led presentations and all courses are CPD certified. Once you have successfully completed training, you will be able to print your course certification. They offer online courses, which include: CPR and AED training, Medication Administration, SOVA for protecting vulnerable adults, Dementia Awareness and more. 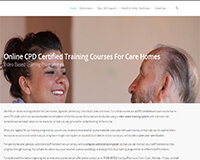 Additional information regarding the training they offer can be found via their website: Online Training For Care Homes.